Around 1920-1924 the (Canadian) government put out notices, in papers, to encourage Europeans, especially Russians, to immigrate to Canada. As my father worked at the trains, he knew which ones were coming in on what day. 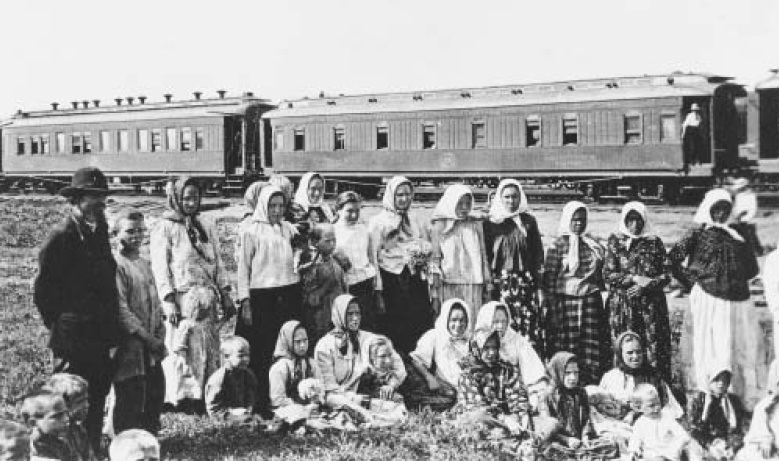 Russian immigrants to Canada, specific location unknown. I was about 12 years old, and Charlie 10. One day Dad said, "You both come to the station on Saturday, I want to show you something." That "something" was the sight of over fifty people from Russia, getting off there. Others got off at other stations farther on. These people took the "grant of land" and money and came to live here and work. Not many were there to greet them, only those who came to pick them up. Those poor, tired people, oh. They had many cases, full of possessions, packed in woven, greyish coloured big wicker baskets, on wheel casters that moved easily. The children, all sizes, were half asleep. Then everyone was gone. In later years some of these people were our close, friendly neighbours. I had many Russian friends at high school and they got a good education. They also did beautiful sewing and embroidery. Years later, hockey came on the scene, lots of fun. Sidorchuck, Lapinsky, Palen, were a few names I remembered... One of the oldest Russian ladies I met in Calgary, was Ed Sidorchuck's mother, she was sweet, with her broken English, it was so very interesting to visit her in her home. Al Samek, Ron's first apprentice, was a very good Russian friend too. So I think the Russians did a good thing to come. We had planned to wed, now my Sonya's dead. So I weep and mourn, my Sonya now has gone." Mom must have been very sad at that time of life. Her own Mom died just after Eddie was born, in 1917. Such a troubled world, and I remember her singing to my new baby brother, and Charles saying "put the dolly down and put me on your knee." (Mom told me this.) All this sorrow must have registered in my mind. Gran was gone, we all felt lost, I guess. But we all survived. Thank God for his love. At this time her brother, Fred Taylor, was a POW in Germany. Poor Mom, but she got over all this and was happy again.